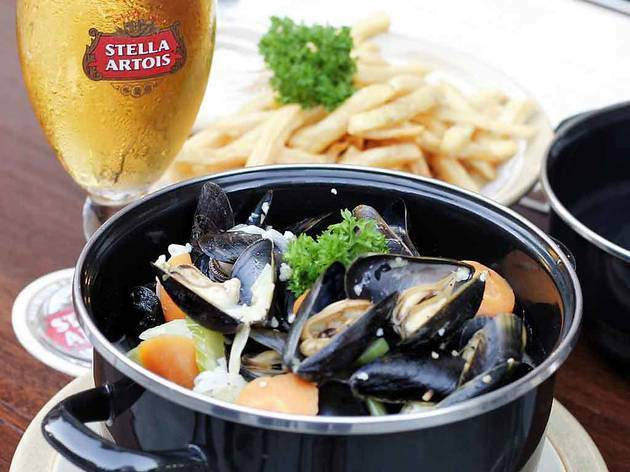 The Belgians are known for their love of beer and delicious food – both served here in hearty portions. It has been said their food has the finesse of the French and generosity of the Germans. Oosters opened its doors as Singapore’s only Belgian Brasserie in 2004 and takes great pride in introducing guests to a range of Belgian beers. It stocks over 20 bottles, from light golden pilsners and aromatic abbey ales to strong Trappist brews and sweet, fruity lambic beers. Beer is also used in food preparation to add extra flavour. The pairing of beers is unique to the Belgians. 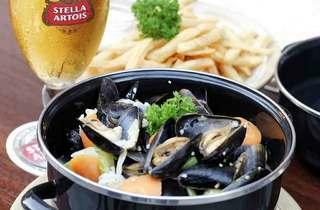 Oosters recommends a crisp glass of Stella Artois to complement a large pot of mussels and fries.